Has my title got you wondering? Well there are two parts to my post, which is the second post in one day. First of all the challenge..... Well, the greeting farm had their first ever customer challenge and chit chat night last night. It was a blast, and although i had no time to craft on the night, i managed to make a movie-themed card tonight. Here it is. I hope you can tell which movie it's from. Hopefully you guessed High School Musical right away. When the movies were released a few years back, ALL of our four girls were absolutely obsessed with all things HSM! Now, for the HIJACKED part of my post. Harriet, my daughter who turned 14 yesterday (see previous post), loves to craft, and especially loves to color with copics and paper-piece. Recently i noticed that La La Land crafts has a kids blog with challenges, and she was keen to enter. So here is HARRIET'S first ever challenge entry. The challenge was to use polka dots. She used Hunny Bunny Marci, with dots on her hat, skirt and background. She would love her own blog, but for now, will have to make do with posting on mine. Thanks for looking. I'm sure Harriet would be thrilled if you'd like to comment on her card here. Yesterday we celebrated DD#2's 14th birthday. We had a lovely morning at the Ballarat Show, followed by an afternoon at the movies, then dinner at Harriet's favorite restaurant. Cake decorating is her passion at the moment, so when my very first "taylored expressions" stamps arrived last week, i knew right away which one i was going to use. ....and of course the birthday girl with the cupcake birthday cake that i made for her! That's all for today. Off to pack for school camp. Thursday morning means Jen's new sketch is out. I am so thrilled to be guesting on her amazing DT for 3 months. I'm having a blast. Did you notice i didn't stamp or use copics today. Quite a change for me, but i always like change, otherwise life would be pretty boring! I'm hanging out to see what the rest of the DT has been up to, as I'm sure you are too. So here's a list of the DT links. After you've checked them all out, why don't you join in the fun. Full details on how to enter are included on Jen's Deconstructed Sketch blog. As promised, we are here today with a special CLEAR STAMP SHOWCASE and a ONE-DAY only SALE! For today only, all clear stamp sets are only $12 each! We want to make your holidays as stress-free as possible and who doesn't love a little online shopping to save from bearing the crowds and crazy limited quantities out there? 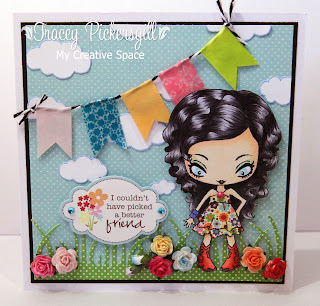 We are so excited to bring you our "CLEAR STAMP SHOWCASE" today at The Greeting Farm! In addition to our one-day sale, we have a few prizes along the way! Not one, but TWO LUCKY WINNERS will win a clear stamp set of choice just for hopping with TGF today! Our clear stamp sets are made from high-quality photopolymer and we are very happy so far with the feedback we've received from both our design teams and customers alike! We asked everyone to be very candid with us to make sure that we were bringing you the same, quality TGF product you'd expect from us. I, for one, am super-fussy when it comes to clear stamps. I refuse to stamp with cheap and nasty acrylic, as they just don't produce a clean image. However, you'll be pleased to know that TGF only uses high quality photopolymer to make their clear stamps, and the image is sharp, time after time. We love being able to bring you such fun and versatile lines of images and our clears are no exception! While we won't be going all clear, we do enjoy the versatility of this new line and really hope you do, too! With our newsletter coming right around the corner on the 15th, we'd love to offer a Clear Stamp Showcase: Newsletter edition to get our customers even more acquainted with our Clear line and would love to see YOUR submissions! Please email Jessica at yeahshestamps@gmail.com by November 12th to submit your entry for consideration with a short write up of your project. Showcased projects will WIN a free stamp! back to the TGF Blog! Thanks so much for joining us today as we CLEARLY can't wait for you to enjoy this special event! Don't forget that the DECEMBER Guest Designer contest ends 11/10, so make sure to get your entries in to Jess before the big reveal of Phase 1 on our Facebook page on Friday, 11/11! I hope everyone's having/had a lovely weekend. I have a big week coming up, with Ingvild Bolme coming to teach a workshop in my store on Tuesday, and also preparing for DD#2's 14th Birthday on Saturday. I do, however have a card to show before i begin yet another crazy week. I really should do this more often. While i had these Jillibean soup papers on my craft desk, along with matching markers and of course Jen's sketch, it only took a fraction of the time to whip up a few extra cards that are similar, but not identical. During the TGF release party chat over at SCS i mentioned that i was going to color Matilda's hair using a different technique. Well, this is her, and i have colored her hair as though it were going to be black, and then when i'm finished, i color completely over it in my color of choice, whether this be pink, blue, or in this case red for Christmas. I have a photo step-by-step tutorial here if you are interested. I'll be back Tuesday after Ingvild's class with a special TGF event. Whimsie Doodles is so excited to be sponsoring the new challenge! In March of 2009 Melyssa Connolly, artist and owner, began turning her whimsical hand-drawn images into digital files for sale online. Whimsie Doodles' digital stamp line features images that range from cute little boys and girls, to punny stuff, and everything in-between. We enjoy sharing lots of samples on ourcompany blog, where we also post challenges and tutorials. YAY!!! 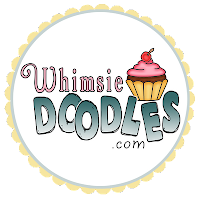 Thank you so much to Whimsie Doodles for sponsoring us today and for offering such a special treat to all of our fans! As soon as I saw this cute little peguin I knew he would go perfectly with Jillibean Soup's new Christmas papers, which just so happen to feature penguins. I added a paper-pieced penguin scarf using Doodlebug dp, and some new MME twine, and there you have it. Such a fun, easy sketch to work with. Thanks Jen. 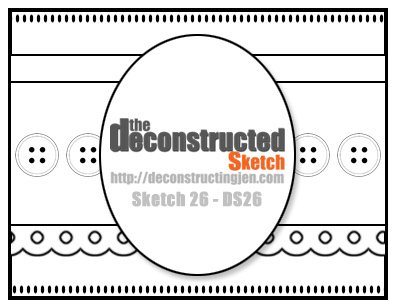 Please visit the rest of the Deconstructed Sketch Girls to see what they have created this week! !